The Street Orchestra of London is a pop-up orchestra bringing free orchestral music to everyone, captivating every possible audience. 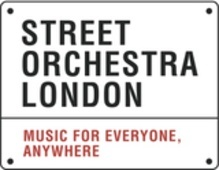 As well as free street concerts, the Street Orchestra of London performs for communities who rarely have exposure to live orchestral music with concerts in prisons, hospitals, asylum seekers' centres, hospices, shelters for the homeless, old people's homes and schools. Produced by Nonclassical, an east London charity offering classical club-nights and a record label for contemporary classical music.